Only a few of these kinds of weekends left. Love your necklaces and love the outfit! Sounds like you had a fabulous relaxing weekend! You are precious! I would probably break my neck in those shoes:). I LOVE those sandals! I wish they were in my size. Your weekend sounded so wonderful. I'm so glad you are enjoying your summer! Great top - love it; it's so versatile. I love that top! And this whole outfit is just adorable! Ah, yes. Now that is a perfect weekend. Sounds fantastic. By the way--LOVE the necklaces you are wearing. It sounds you had a wonderful weekend! I enjoyed my weekend as well. I went to the Randolph Street Market here in Chicago and read book one of The Hunger Games. So good! Such a great outfit. I can totally see myself in that. i am totally wearing a super similar outfit right as we speak haha!!! You also look so put together! Love stripes and those sandals are great! i hate how quickly this summer is going by! love those sandals, so bold and pretty! great outfit! and that IS the perfect summer. everything about summer is just divine. I love this outfit but I'd really like a pair of those shoes! wow! Love the stripes, the color of the shoes and the hair! Pretty and relaxed. Love, love stripes! And your top knot. Favorite go-to look. Glad you had a wonderful weekend- summer weekends are the best! oooh I hear ya! I am so busy in the month of August, all fun things but I wish I had time to have more weekends like this! :) You look adorable by the way! Just found your blog from Michaela, I really love it! i totally love the top knot. i have crazy frizzy hair & wear it in a top knot almost everyday of the school year! i teach first grade & can't have the hair getting in my way all day! such a fantastic list - esp the Olympics! and girl, i love this whole outfit. i have actually been eyeing those shoes since they were featured in the lookbook! Such a perfect weekend Anna! I feel that summer has only just begun, help, we need to make it longer! Have a fab start to your week! you look adorable! and my weekend was very similar! You look so sassy! I love love love those sandals! Those shoes are amazing, and the first photo is so much fun!! Very cute look! I'm always a fan of stripes!! 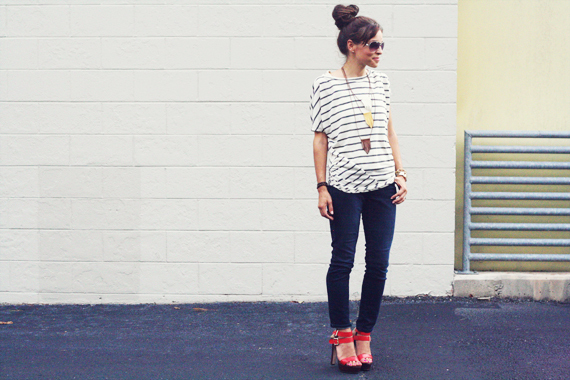 I really think there's nothing more classic than nautical stripes and dark jeans! i live for this sumer description...savoring every last minute! Sounds like a perfect weekend! I am sad summer is coming to an end. Your SHOES!!! Did you see them? They are awesome. Such a cute look! Loving the pop of red with your sandals! really and truly love this look on you, Anna! What a fun weekend you had! And you seriously have the best outfits Anna! Loving this look hon! It has such an chic urban vibe! The top knot and necklaces are great accessories to this casual outfit..I think I am loving you! such a classic look. love!